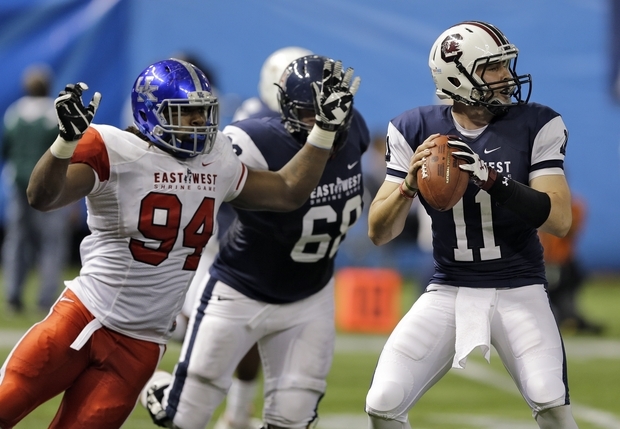 Za’Darius Smith led a dominating group of defensive linemen at the East – West Shrine game. Smith was voted the MVP. Less than a week after a new National Champion was crowned, the first two All-Star games took place, allowing NFL teams to get a look at this year’s crop of seniors. Yesterday, I wrote about the NFLPA Bowl and today it’s time to discuss the East – West Shrine Bowl. The players in this bowl are usually a step above the players in the NFLPA Bowl and possibly a step below the players in the Senior Bowl. However, last year an unknown player, Eastern Illinois QB Jimmy Garoppolo looked impressive in this game. He was then invited to play in the Senior Bowl and he ended up going from possibly undrafted to a 3rd round pick of the New England Patriots. Garoppolo proved that a good showing in this game can shoot you up the draft boards. Anthony Boone-QB-Duke (6-1, 225): Smart player that has helped to transform the Duke program. Athletic and moves well in the pocket. Doesn’t hesitate to tuck the ball and run. Has good technique. Doesn’t have great size. Completed 4 of 8 for 49 yards and ran it 2 times for 8 yards. Taylor Heinicke-QB-Old Dominion (6-1, 210): 2012 Walter Payton award winner, given to the top player in the FCS. Slippery and hard to tackle. Does a good job using his eyes to look off defenders. Moves well in the pocket. Needs some work on technique. Completed 2 of 9 for 14 yards and threw 1 interception. Hutson Mason-QB-Georgia (6-2, 210): Good mobility. Throws a nice deep ball. Needs to speed up his decision making. Looked the best out of all the East quarterbacks. Completed 7 of 8 for 71 yards and had 2 carries for 15 yards. Taylor Kelly-QB-Arizona State (6-2, 211): True dual threat. Lacks great arm, but has a good ball location. Makes quick decisions and improvises very well. Good ball handler. Was the most successful West quarterback, completing 7 of 13 for 65 yards and also led the team in rushing with 23 yards on 5 carries. Cody Fajardo-QB-Nevada (6-2, 215): Followed Colin Kaepernick at Nevada and has some similarities to his game. Dual threat. Moves the sticks with his feet. Has no experience under center until now. Struggled in the game. Only completed 2 of 6 for 5 yards and an INT. Had 13 yards rushing on 2 carries. Dylan Thompson-QB-South Carolina (6-3, 218): Pocket passer. At times, stares down his receivers. Did not have a good game. Only completed 1 of 6 for 5 yards and 1 INT. Terrence Magee-RB-LSU (5-9, 217): Good size and runs with power. Makes one cut, then hits the hole. Good footwork. Used in a rotation at running back at LSU, but was voted a team leader. Bounces off tacklers. Finishes runs. Had a good week and finished with 11 carries for 27 yards and 1 catch for 14 yards. Dominique Brown-RB-Louisville (6-2, 240): Big and tall with an upright running style. Shared time for the Cardinals, so he doesn’t have a lot of mileage on him. Good north – south runner. Keeps feet moving after contact. Stiff hips. Takes on tacklers and pushes the pile. Scored the only touchdown for either team. Led his team with 19 carries for 70 yards. John Crockett-RB-North Dakota State (6-0, 202): Has ability to start inside and bounce to the sideline. Can juke defenders in space. Had 5 carries for 8 yards. Zach Zenner-RB-South Dakota State (6-0, 220): Good size. Two straight seasons of rushing for over 2,000 yards. Very good hands. Has a feel for finding daylight. Malcolm Brown-RB-Texas (5-11, 230): Good size. Tough inside runner with the speed to bounce it outside. Only had 4 carries for -2 yards. Larry Dixon-FB-Navy (5-11, 239): Very productive as an option fullback. Good north – south runner. Has a surprising ability to get outside for an option fullback. Only had 1 carry for 1 yard and was called for a holding penalty. Tre McBride-WR-William & Mary (6-2, 205): Good size. Stood out in practices. Makes catches in traffic. Knows where the sticks are. Had 2 catches for 23 yards and had one drop. Darren Waller-WR-Georgia Tech (6-6, 240): Great size, but does he have the speed to separate for the defender? Huge target. Very big catch radius. Was held without a catch. Devin Garner-WR-Michigan (6-4, 216): Good size. Began his career with the Wolverines, but moved to quarterback after Denard Robinson was injured. Had struggles at quarterback, so he will be asked to play receiver in the pros. Looked rusty running routes. Does a good job using his body to screen off defenders. Runs tough after the catch. Had 2 catches for 20 yards. Andre Davis-WR-South Florida (6-2, 210): Good size. Quick feet. Led the East team with 36 receiving yards on 3 catches. Deon Long-WR-Maryland (6-1, 195): Had 3 transfers in his 4 years which may make NFL teams question his commitment. Good size and hands. Makes tough catches. Has a good feel for the passing game. Led the East team with 4 catches for 29 yards. Austin Hill-WR-Arizona State (6-3, 212): Had 81 catches for 1,364 yards and 11 TD in 2012. Missed all of 2013 with a knee injury. Whoever drafts him could be getting a diamond in the rough since it is usually year two when a player fully recovers from knee surgery. Great body control and footwork. Does a good job coming back to the ball. Moves the sticks. Led the West team with 4 catches for 41 yards. Kasen Williams-WR-Washington (6-3, 217): Big body. Good speed. Has the ability to return punts and kickoffs. Was held to only 2 catches for 6 yards. Darrian Miller-G-Kentucky (6-5, 290): Powerful road grader that excels in run blocking. Had a good week. Jermauria Rasco-DE-LSU (6-4, 259): Good motor and doesn’t give up on plays. Smart player that stays home on plays away from him. Great work ethic. Good inside move. Could be a candidate to move to outside linebacker. Had 2 sacks. Za’Darius Smith-DE-Kentucky (6-5, 270): High motor. Versatile player that can play the run or rush the passer. Does a good job pressuring quarterbacks. Was voted the game’s MVP. Anthony Chickillo-DE-Miami (6-4, 275): Had a good week of practice and dominated at times during the game. Quick first step. Pursues down the line of scrimmage. Relentless pass rusher. Playing with a chip on his shoulder because of doubts about his athleticism. Created havoc. Had a sack. Martin Ifedi-DE-Memphis (6-4, 270): Uses his hands to separate from blocks. Had a tackle for loss. Daryl Waud-DT-Western University (Ontario) (6-5, 290): Good size. Quick off the ball. Able to put good inside pressure on the QB. Had a sack. Derrick Lott-DT-Tennessee-Chattanooga (6-4, 298): Quick off the ball. Had a tackle for loss. Xavier Williams-DT-Northern Iowa (6-2, 308): Stood out in practices. Has 7 blocked kicks in his career. Gives great effort. Knows how to get skinny to get penetration. Called for an offside penalty. Travis Raciti-DT-San Jose State (6-5, 285): Has good size, but has short arms which can make it difficult to separate from blockers. Stands his ground and doesn’t over pursue. Had a tackle for loss. Tyeler Davison-DT-Fresno State (6-2, 310): Strong at the point of attack. Has the ability to fight through double teams. Uses his hands well. Had a tackle for loss. Tony Washington, OLB, Oregon (6-4, 245): Impressed coaches because he played in the National Championship game on Monday and showed up for practice this week. Seems to have a passion for the game. Has the ability to take on blockers and still make plays. Had a tackle for loss. Deiontrez Mount-LB-Louisville (6-5, 243): Three down linebacker. Drops well into pass coverage. Strings out plays to the outside to allow support to catch up and gang tackle the runner. Jake Ryan-LB-Michigan (6-3, 240): Four year starter. Does a good job following his reads and running to the ball. Smart player that is all over the field. Blue collar player that isn’t the most athletic, but he is always around the ball. Had a sack. James Vaughters-LB-Stanford (6-2, 255): Disruptive. Could play inside or out, but has the build to play inside. Ben Heeney-LB-Kansas (6-1, 228): Big hitter. Good special teamer. Bryce Hager-LB-Baylor (6-2, 230): NFL bloodlines, son of Britt Hager. Drops well in coverage. Good open file tackler. Justin Coleman-CB-Tennessee (5-11, 190): Breaks well on the ball. Good in off coverage. Quick feet. Able to cover slot receivers. Tye Smith-CB-Towson (6-0, 185): Flies to the ball. Tackles well in space. Cam Thomas-CB-Western Kentucky (6-1, 200): Good in deep coverage. Competes for the ball in the air. Could possibly be looked at as a safety also. Gregory Henderson-CB-Colorado (5-11, 185): Stays in good position. Contests throws. Josh Shaw-CB-USC (6-1, 200): Suspended for most of the year for lying about how he hurt his ankle. Good build, long arms. Gets in and out of his backpedal quickly. Good closing speed. Might be looked at as a safety. Had an interception in the end zone. Bryce Callahan-CB-Rice (5-10, 185): Good in off coverage. Smooth backpedal. Gets his hands on a lot of balls. Good quickness. Bobby McCain-CB-Memphis (5-11, 190): Comes up quickly to support the run. Good tackler. Drives on the ball. Able to return kicks and had a 48 yard kickoff return. Damian Parms-S-Florida Atlantic (6-2, 210): Long and lean. Does a good job undercutting receivers. Reads the quarterback’s eyes and breaks well on the ball. Made a name for himself picking off two passes. Next Wednesday I will be discussing the Senior Bowl. If you like what you read, like us on Facebook and tell your friends. This entry was posted on January 23, 2015 by draftmaniacs in Uncategorized and tagged 2015 NFL draft, Andre Davis, Anthony Boone, Anthony Chickillo, Austin Hill, Ben Heeney, Bobby McCain, Bryce Callahan, Bryce Hager, Cam Thomas, Cody Fajardo, Damian Parms, Darren Waller, Darrian Miller, Daryl Waud, Deiontrez Mount, Deon Long, Derrick Lott, Devin Gardner, Dominique Brown, Dylan Thompson, East - West Shrine Game, Gregory Henderson, Hutson Mason, Jake Ryan, James Vaughters, Jermauria Rasco, Jimmy Garoppolo, John Crockett, Josh Shaw, Justin Coleman, Kasen Williams, Larry Dixon, Malcolm Brown, Martin Ifedi, NFL, NFL Draft, Taylor Heinicke, Taylor Kelly, Terrence Magee, Tony Washington, Travis Raciti, Tre McBride, Tye Smith, Tyeler Davison, Xavier Williams, Za'Darius Smith, Zach Zenner.